New research has found that applying physical force on one’s breasts can prevent malignant cancer cells. Researchers at the University of California Berkeley and the Lawrence Berkeley National Laboratory presented their findings Monday at the Society for Cell Biology in San Francisco. Squeezing breasts can help guide cells back into a normal growth pattern, stopping the “out-of-control” growth of malignant cancer cells. To conduct the study, researchers grew malignant breast epithelial cells that were injected into silicone chambers. Once injected inside the flexible chambers, researchers began to apply physical force in the first stages of cell development. Researchers noticed that the malignant cells that were compressed became healthier and more organized compared to the cells that were not. The compressed malignant cells stopped growing when the new breast tissue structure was formed, even after physical force was stopped. “Malignant cells have not completely forgotten how to be healthy; they just need the right cues to guide them back into a healthy growth pattern,” Venugopalan said. Despite the findings, researchers warn that this won’t cure breast cancer. 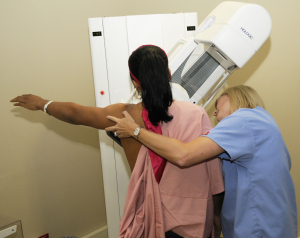 The Centers for Disease Control and Prevention says breast cancer is the most common cancer among women in the U.S. Over 40,000 women died from breast cancer in 2008.